On October 29th (Sunday), the Kagawa Rainbow Film Festival will be held at Sunport Tower, on the 5th floor of E-Topia! 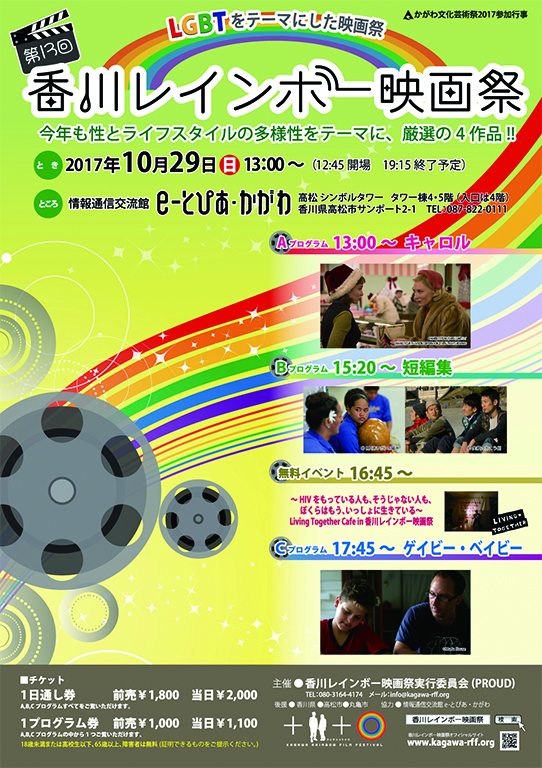 The Film Festival will be held by PROUD, an LGBT organization in Kagawa, and will feature films with LGBT-related content. The full day pass ticket is ¥2000 (¥1800 in advance), and tickets for a single program are ¥1100 (¥1000 in advance). To buy tickets in advance, please use the “contact” feature on this site. English is OK.
All films are in English with Japanese subtitles, except for “Egao no Mukougawa” which is in Japanese with English subtitles. There will also be a Cafe Area where you can drink coffee and take a break. Please come and enjoy the Kagawa Rainbow Film Festival!